Every sixteen minutes, a child in the United States is diagnosed with Autism. In Charlotte, at least one child is diagnosed with Autism every day. Autism is now the most prevalent developmental disability affecting more children than cerebral palsy, down syndrome, hearing loss, and vision impairment. In fact, more children will be diagnosed with autism than with childhood leukemia, diabetes, and cancer combined. 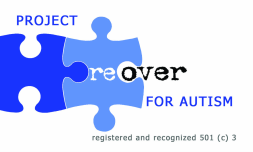 PROJECT REOVER is a non-profit Charlotte based organization, established in 2012 as the only autism charity in S. Charlotte that provides support and promotes opportunities that enhance the lives of children within the autism spectrum and their families. Our charity is dedicated to raising money to fund autism research, awareness, and education. PROJECT REOVER was founded by Karen Mangeney and powered by volunteers, parents, professionals and sponsors throughout the community. We invite you to learn more about autism and our organization on the pages of our website.